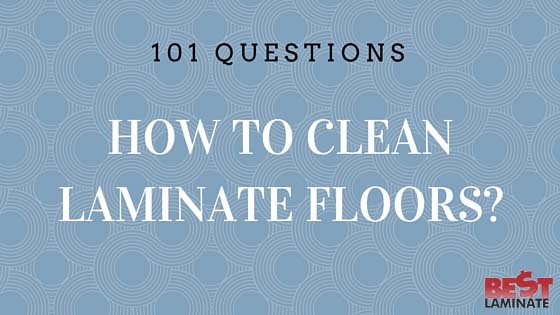 Home >> 101 Questions Series >> 101 Laminate Flooring >> How to Clean Laminate Floors? Knowing how to clean laminate floors is the first step to keeping them beautiful for years to come! Laminate floors are designed to be easy to clean and easy to maintain. We’ve prepared a few tips for you that might come in handy! Buy yourself a good quality microfiber mop with removable cloths or individual cloths for small areas. Keep a couple extra microfiber cloths handy this way when one gets a little too used you can toss it and you’re onto the next. A water and vinegar solution is the best solution to clean your laminate. The all natural mixture is safe for your home and family, affordable, and has disinfecting properties. Cleaning with this solution will bring the shine of your floor back, and remove smudges and dirt. Mix 1 cup of white distilled vinegar with 1 gallon of water. *You should always use this solution minimally! Do not allow pools of water sit on your laminate flooring. If you want to use a store bought cleaning solution, be sure to read the product information to make sure it is safe for laminate. Most manufacturers sell specific cleaners as well! Believe it or not Acetone can help with just about anything! Okay, maybe not ANYTHING… but it can remove some common stains like permanent marker or crayons from your flooring easily! We hope you keep these helpful hints in mind on how to clean laminate floors next time you’re tidying up your home! Do you have any more questions? Leave us a comment and we will be glad to help you! *This post was updated from 2010 to give you a better reading experience and better tips on cleaning your laminate flooring! Hi Marty – You should never use a steam mop on your laminate flooring. The moisture and heat from the steam is too humid for the laminate flooring, even on its low setting. It will cause your floor to bubble and the only way to fix the planks is to replace them. If you need to mop your floors, use a solution of 1/4 cup white vinegar to 1 gallon warm water and use a damp mop. I hope this clears things up for you! I might want to know whether it is sheltered to utilize a steam mop, for example, the Shark Steam Mop, on wood cover ground surface. I would just be utilizing the Steam Mop about once per month, however would not have any desire to harm the floor. You should never use a steam mop on laminate, solid hardwood, or engineered hardwood flooring. The moisture from the steam is too much for the flooring to handle, possibly causing the floor to buckle or warp and voiding your warranty. Don’t take the risk and even use it once! I have the same issue as many,dull film demonstrates each shoe or foot shaped impression, ,seat mark I have constantly utilized items for lam floors,and vin and water still dull.I have utilized mico mops flushed with water after vin wash no good.Whats too do? Much obliged to you for this data. I’ve been considering attempting this and was glad to discover more data on it. For others pondering, I utilize a steam mop on my pergo floors about once every week, at times more and haven’t had any issues with it yet. Been utilizing it for a year now. Hi Monika! Thanks for your feedback. I’m glad you haven’t had any issues with a steam mop, but just keep in mind that the heat and steam can cause warping or damage to the planks. Hello! We would love for you to share our posts. Thanks! How can I tell if my kitchen flooring is Hardwood or Laminate??? Hi Jim! Thanks for the question! There are a few different ways to test if your floor is hardwood or laminate. 1. Take a ballpoint pen, and in an inconspicuous area of your floor, press the tip of the pen down into the floor. If a dent is left, your floor is hardwood. If there is no dent, good chances are your floor is laminate. 2. Determine how the floor is installed. If you see staples or nail holes, the floor is solid hardwood. If you don’t see any, your floor could be a floated engineered hardwood or laminate. 3. The grain of true hardwood flooring never repeats. Laminate floor designs have gotten very detailed in recent years so they resemble hardwood, but there will still be repeats. Check for unique knots in the floor boards. If you can’t find a match in a different floor board, your floor is probably hardwood. If you still have questions, please don’t hesitate to call us at 1-800-520-0961 or use our online chat feature at bestlaminate.com! Can you use the Shark Sonic Duo on laminate floors (it is not the steam machine) with a laminate approved cleaner? I believe you can use the Shark Sonic Duo on laminate floors as long as it will not apply steam or any heated moisture onto your floors. I personally use a Swiffer Wet Jet on my floors and I have no problem with warping or water damage. If you are still concerned about it ruining your laminate flooring, try cleaning a small area where it won’t be noticeable and see how it looks! I hope it works out well for you! The Shark Sonic Duo looks like an awesome cleaning appliance! I have the same problem as many,dull film shows every shoe or foot print ,chair marks(covered w/pads) I have always used products for lam floors,and vin & water still dull.I have used mico mops rinsed with water after vin wash no good.Whats too do? Linda, I would try to use acetone on a small area. It’s safe to use on laminate flooring and it will not damage it at all (laminate flooring is resistant to chemicals). It is possible that cleaning products created a thin layer sitting on the top of the flooring surface and this may create the “haze” you are referring to. Mopping with water and vinegar should follow. Make sure to have your windows open when using acetone. Thank you for this information. I’ve been thinking about trying this and was happy to find more info on it. For others wondering, I use a steam mop on my pergo floors about once a week, sometimes more and haven’t had any problems with it yet. Been using it for a year now. Hi Amy, you are so welcome. We are happy we can help! I forgot to ask if it is OK to use a steam cleaning floor machine using the vinegar/water mixture you recommend? Is the temperature of the steam cleaner too hot for laminate flooring? On the demonstrations for these steam cleaners the sellers for three companies show them cleaning laminate and wood floors. Of course, they want to sell their machines, but I would like to know if this is safe from an unbiased view point. Thanks in advance for answering my question; very much appreciated!!! This is the first site I’ve looked at that I have been able to print. THANK YOU a million times over for that and all the useful hints. We just had our Pergo flooring installed and are thrilled with the outcome. The installers recommended that we go on the Internet to obtain instructions for cleaning. I appreciated your suggestion for the use of essential oils; LOVE that idea and plan to put that to use immediately. Thank you many times over for your information!! Hi I have an Alloc commercial flooring that was installed in my hair salon. I am having serious difficulties cleaning it. I have used the free and clear on a dry mop and it still shows every streak. There is no shine to this floor whatsoever and every footprint is shown. Obviously this is a high traffic place and no one ever told me that it would look horrible 100% of the time. Even if it is clean the minute someone steps on it you see everything. I had a Pergo before this that had a high gloss and all I had to do was wipe it with a damp cloth and even at that it barely showed any footprints.This was an insurance replacement and this is the floor that they recommended .Not happy at all. I spend more time trying to clean my floor than cutting hair! Christine, try water and vinegar solution. It works great for us. Here are few tips for you. I hope it helps. it does not have a nice shine. I keep it clean with a dust mop. So its not caused by dirt. What can I do? Pat, it depends on what kind of finish you have on your laminate. High gloss or non textured laminate floors will tend to show more foot and paw prints on average than textured or hand-scraped laminates. The only thing that you can do is keep cleaning the floor as usual and maybe put down an area rug or floor mat for the high traffic areas. I’ve read all your comments and wonder – why if you recommend vinegar / water to clean pergo floors, why ,when I purchased my pergo flooring was told only to use pergo cleaner to clean it with, which I promptly purchased. Colette, Vinegar and Water is a good household mixture that is very effective at cleaning laminate flooring. Pergo recommended that you only use their Pergo brand flooring cleaner because they wanted you to buy their product. It will not void your warranty if you use vinegar/water or another brand of flooring cleaner to clean your floor. I’m a professional house keeper and have found over the years that on laminent flooring (not nessecarily pergo) in rooms with abundant natural light no vinegar mixture or anyother cleaner that I’ve found remove the natural oils from barefeet!!!! I can get them off my hand scrubbing the entire area, but in a high traffic area…that is time consuming and exhausting….is there anyother product that will remove the natual oils from these floors safely? Mary-Lynn, we sell Alloc Free and Clean Laminate flooring cleaner on our website http://www.bestlaminate.net. It is probably the best laminate flooring cleaner on the market. Also I use a swiffer on my laminate floor and it seems to work pretty well at removing everything from footprints to dirt and dust. What if your pergo floor has developed a film over the years? Our kitchen floor is white granite (pergo select). over 8 years it has significantly dulled with a film over it. With a lot of elbow grease, i can make a dent in it spot by spot, but don’t have the time or energy to scrub really hard for the time it would take to clean it thoroughly. sad ot be in this condition, but that’s where I am. Suggestions? Can the vinegar/water solution be used to clean Alloc laminate floors? Hi Jan~ You can most definately use the vinegar/water solution on the Alloc floors! It can actually be used on any kind of laminate floors. If you want to get rid of the harsh smell of vinegar, you can add a few drops of essential oils as well! http://100pureessentialoils.com/. Enjoy your floor! Can Swiffer be used on Pergo floors? Patricia, thank you for your question. I would like to know if it is safe to use a steam mop, such as the Shark Steam Mop, on wood laminate flooring. I would only be using the Steam Mop about once a month, but would not want to damage the floor. I appreciate any information you can give me on using steam to clean this type flooring. a water damage. Check your warranty if using this kind of equipment is allowed /forbiden by manufacturer and be sure your floor is installed properly- and there is no gapping so stem (water vapors) are not trapped init. The steam penetrates between the joints and expands the wood and may be the reason of “buckiling”. How can I get orange glow wax off of my pergo floors? Please help!!!! Orange Glow is very hard to remove. The only solution that works is aceton. One of our customers tested and it worked, however you have to be very careful -keep windows open and fix small sections at the time. This is an old question I noticed, but I have personally done this so I wanted to respond for anyone who might also have this problem. This stuff is very hard to remove and should be taken off the shelves. My husband and I bought what was our dream home with gorgeous cherry wood floors. Unbeknownst to us the previous owners had been using OrangeGlo to clean their floors for who knows how long. Not long after we moved in I noticed that the floors looked awful. They were dull and had footprints all over them. Everytime I tried to mop, they still seemed dirty and smudgy. It seemed to get worse every time. So I spent hours and hours researching wood floors and cleaners and how to remove wax buildup. I tried some different things and finally settled on this: I soaked a rags in a solution of warm water and vinegar. I placed the rags on the floor in sections and allowed them to sit for 10-15 minutes. (Don’t worry if you have as much OrangeGlo on your floor as I did, the water will not damage it. Also keep in mind that I did wring the excess water out. ) Then I removed the rags one at a time. The area under the rag should have a whitish haze. At that point you are ready for removal. I found that a plastic putty knife (one with a smooth edge so it doesn’t scratch the floor) was the right tool. Then scrape away. The residue will practically scrape up in sheets. The areas that had the least amount of residue were the hardest to remove. This is a hellatious task especially when you have 2000ish square feet of it as I did. I know it’s not what you want to hear when faced with it, but it can be done. It takes time and perseverance (months in my case). But every little section you can finish is a win. Keep in mind though that it looks terrible in the meantime. The wood underneath it much more beautiful, but not nearly as shiny. Good luck and never use that OrangeGlo crap again!! !